Evert A. Duyckinck (Evert Augustus), 1816-1878 and George L. Duyckinck (George Long), 1823-1863 University of North Carolina. From Cyclopædia of American Literature; Embracing Personal and Critical Notices of Authors, and Selections from Their Writings. From the Earliest Period to the Present Day with Portraits, Autographs, and Other Illustrations. By Evert A. Duyckinck and George L. Duyckinck. In Two Volumes. Vol. II. University of North Carolina. From Cyclopædia of American Literature; Embracing Personal and Critical Notices of Authors, and Selections from Their Writings. From the Earliest Period to the Present Day with Portraits, Autographs, and Other Illustrations. By Evert A. Duyckinck and George L. Duyckinck. In Two Volumes. Vol. II. New York: Charles Scribner, 1856. 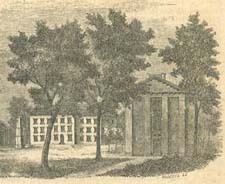 University of North Carolina (1793-1962) -- Alumni and alumna. University of North Carolina (1793-1962) -- Faculty.